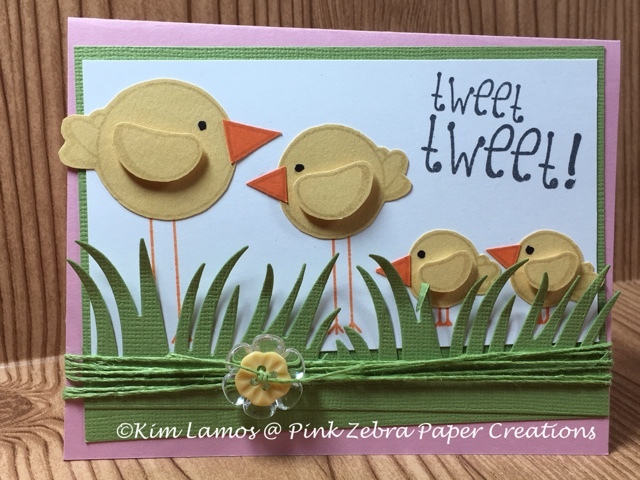 Pink Zebra Paper Creations: Tweet! Tweet! Today is Poultry Day and I have a cute card to celebrate with you. The card is created using the Chick Magnet stamp set. The base of the card is Bubble Gum, Lemon Grass and Whip Cream Cardstock. I stamped the chicks from the Chick Magnet stamp set with Oatmeal Cookie Ink on Pineapple Smoothie and Orange Creamsicle Cardstock. I fussy cut the pieces and used a foam square to pop up the wings of the chicks. I die cut the grass from the Border Details die set from Lemon Grass Cardstock and attached to the bottom of the card. I then stamped the "legs" of the chicks on the Whip Cream Cardstock with Citrus Cooler Ink and the sentiment with River Stone ink. I finished the card by adding Lemon Grass Thread around the card and tied a Clear Bloom Accent and a Pineapple Smoothie button from the Journey Color Buttons II pack. Enjoy!